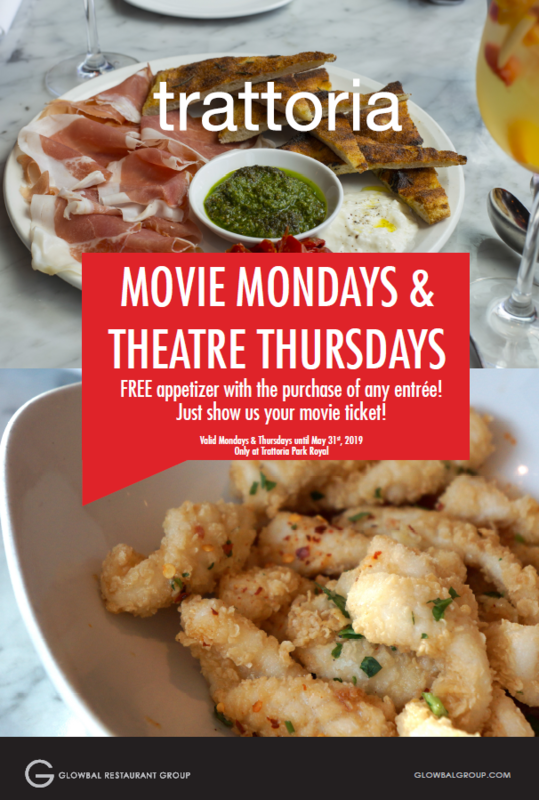 Trattoria is offering a FREE appetizer with the purchase of an entrée when you show your movie ticket on Movie Mondays and Theatre Thursdays.! Trattoria Park Royal is all about traditional Trattoria cuisine, with pastas and classic Italian fare all prepared and served with love. The vibrant room promotes the art of sharing and is a relaxing place to gather for food and wine lovers. The menu reads like a summer in Italy, food made with classic ingredients, masterfully combined and paired inspired wine selections and friendly service. Every neighbourhood needs a Trattoria.